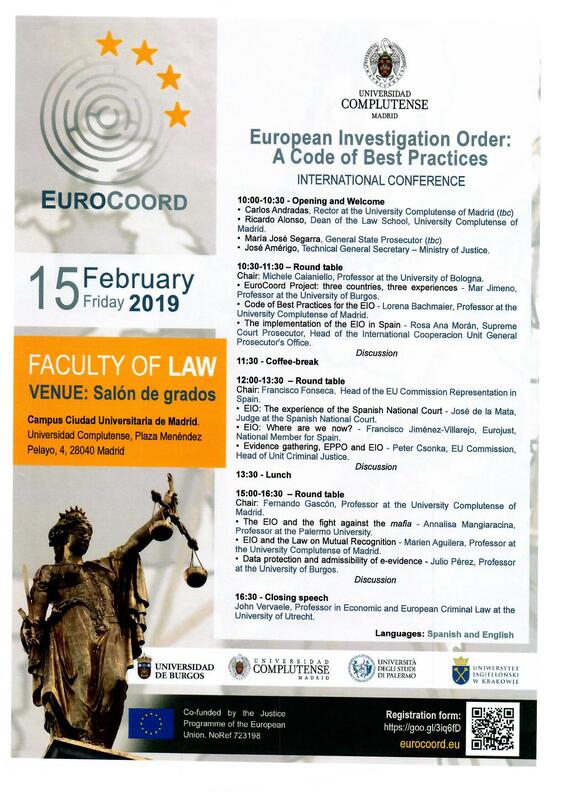 On 15 February, 2019, Complutense University organizes the conference “The European Investigation Order and the Code of Best Practices”, in the framework of the European Proyect “best practices for EUROpean COORDination on investigative measures and evidence gathering – EUROCOORD”. The Conference will discuss the results of the EUROCOORD project on the implementation of the European Investigation Order (EIO) and present the Code of Best Practices. 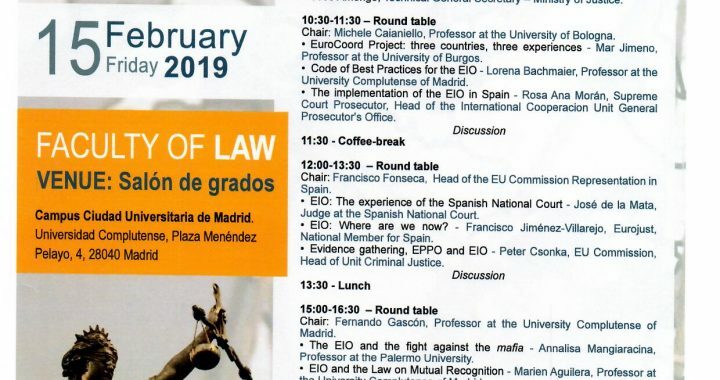 The conference will provide the opportunity discuss the key questions among academics, EU representatives and practitioners on the judicial cooperation within the AFJS and the fight against cross-border crime. Carlos Andradas, (Rector at the University Complutense of Madrid); Ricardo Alonso, (Dean of the Law School, University Complutense of Madrid); María José Segarra, (General State Prosecutor); José Amérigo, (Technical General Secretary – Ministry of Justice); Michele Caianiello, (Professor at the University of Bologna); Mar Jimeno, (Professor at the University of Burgos); Lorena Bachmaier, (Professor at the University Complutense of Madrid); Rosa Ana Morán, (Supreme Court Prosecutor, Head of the International Cooperacion Unit General Prosecutor’s Office);Francisco Fonseca, (Head of the EU Commission Representation in Spain); José de la Mata, (Judge at the Spanish National Court); Francisco Jiménez-Villarejo, (Eurojust, National Member for Spain); Peter Csonka, (EU Commission, Head of Unit Criminal Justice); Fernando Gascón, (Professor at the University Complutense of Madrid); Annalisa Mangiaracina, (Professor at the Palermo University); Marien Aguilera, (Professor at the University Complutense of Madrid); Julio Pérez, (Professor at the University of Burgos); John Vervaele (Professor in Economic and European Criminal Law at the University of Utrecht). There is no registration fee, but please, confirm your participation by registering your self here before 10 February 2019.